Verbringen Sie einen Nachmittag in der Weinstadt Montalcino, probieren Sie den renommierten Brunello di Montalcino und erfahren Sie mehr über die Weinproduktion. Die 3,5-stündige Tour von Siena umfasst zwei Verkostungen, bei denen einheimischer Wein mit Salami und Wurstwaren kombiniert wird. Bewundern Sie die Aussicht auf die toskanische Landschaft von der hübschen Hügelstadt aus und entdecken Sie die Generationen alter Weinbautradition der Region. Beginnen Sie Ihre halbtägige Reise mit einem Abholservice von Siena von April bis November um 14:00 Uhr oder von November bis März um 13:00 Uhr. Dann entspannen Sie sich auf der Reise in die toskanische Landschaft, die die Stadt umgibt. Ihr Ziel ist Montalcino, eine wunderschöne Hügelstadt, die für ihre mittelalterlichen Stadtmauern und ihren Wein bekannt ist. Hier genießen Sie zwei Verkostungen des lokalen Weins sowie Snacks wie Wurstwaren und traditionelle Salami. Sip Brunello di Montalcino Wein und erfahren Sie, wie seine Produktionsgeheimnisse und -traditionen über Generationen weitergegeben wurden. Der verehrte Wein ist eine der teuersten Rebsorten der Welt. Er wird aus Sangiovese-Trauben hergestellt und in speziellen Holzfässern gelagert. Nach Ihren Verkostungen kehren Sie zu Ihrem Transport zurück und fahren zurück nach Siena. Beenden Sie mit einem Rücktransfer in Ihrem Hotel. Loved the morning part of the tour! Stefan made the tour very enjoyable and meeting Mario was a treat. Would give 5 stars but we did not particularly enjoy the second part of the tour. Felt that the proprietor of the wine shop was not very not very engaging and we actually were bored during that part. Thoroughly enjoyed walking around Moltacino! We did not get hotel pick up because we were not within the requirements, but Stefan went out of his way at the end of the tour to take us to where we had parked our car. Much appreciated. This tour is not as described on the website. 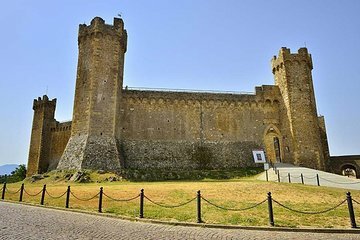 We were disappointed that we had no time to explore Montalcino and there is definitely not a guided tour involved. There are two wine tastings and one occurs in a wine store so if you want a true winery and tasting experience this is not it. We spent more time driving in the car listening to the guide speak Italian to one of the people in the group who also spoke Italian than anything else. Pretty disappointing. This was a terrific experience. There were 8 people on the tour and we all got along great. The driver/guide was very friendly and knowledgeable and clearly knew the hosts at the stops we made. I was a bit disappointed that the first stop was a wine shop in Montalcino. I was expecting to visit a couple of wineries, not a wine shop. But, despite not being at the vineyard, we tasted several different Brunellos at the shop. You could make the argument that it was advantageous to visit a shop BECAUSE you taste several makers. As a wine director in a restaurant, I was more interested in the winemaking process and the vineyards than just tasting, but I may be in a large minority there you decide for yourself. Montalcino is a great deal of fun to visit and walk around in. Obviously, the town is all about Brunello, but there are other stores to visit as well as wine stores. Built on top of a hill, the views from just about anywhere in the town are picturebook worthy. The second stop was at a winery and the owner was quite the show. Probably in his 80's, Mario still loves the ladies and loves his wine. It was a great visit looking over some of his old winemaking tools and some of his older vintages. We bought a bottle as a roadie on the way back to Siena and enjoyed it thoroughly! We had such a good time on the tour and with each other, we all got together for dinner and more wine back in Siena. Go and have a blast! Elio was a great tour guide. Kept us informed and even stepped in by telling us all about the winery when the staff was busy. I'd recommend this company to everyone. Andrea, our local guide provided historical context back to Roman times and how the area developed into a preeminent wine region. Stop at a wine shop for a few tastings was a perfect set up to arriving at the small, special winery famous for worldclass Brunello. Our host signore Mario? Perfetto! Helt fantastisk oplevelse! Kan klart anbefales! This was a good trip but could have been better. There are two wine tastings involved. The first takes place in a wine store and is informative but not a lot of fun. The second is an experience you will talk about for years to come. The owner Mario is just a joy and makes the trip so worth while. You get to go to Montalcino but you will not see a lot of it which is a real pity. I would recommend not doing the first wine tasting in the store and instead just walking around Montalcino and soaking up the atmosphere there instead. The wine tasting in the store is presented very professionally by the store but maybe its too professional. I'm on holiday after all. Its a good trip overall all though and good value. More time in Montalcino is needed though - please! This tour is a great idea, but the drive from Siena was longer than advertised and so the trip became a bit long, not due to the wine tour, but the drive. Our guide, Daniel, was adequate as a driver, but offered very little in the way of tour information. Most of the tour took place in two locations, a wine retailer and a family wine operation. The tour itself was great, thus the four-star rating, with a stop in Montalcino at a commercial wine retailer, where we tasted a number of great Burnello's and then to a local, family-owned winery, for a personal tasting experience and guide with Mr. Mario, the wine master, who is 87 years old. It was special.